Building codes and regulations continue to stress lower flame spread and low smoke generation for many materials. The Steiner Tunnel (ASTM E-84) is frequently referenced as a method to assess flame spread and smoke density and is a mandated test for many commercial building materials. 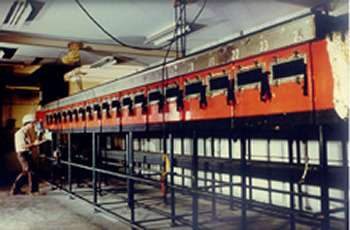 The test consists of a 25' vented tunnel, lined with firebrick, with the test material mounted to the top of the chamber. At one end of the chamber, the sample is subjected to a high-energy flame for ten minutes. Flame spread is determined visually through windows built into the tunnel. An optical cell mounted at the tunnel exhaust measures smoke density. A similar test used to qualify plenum grade communication cable is UL 910. In this case, the test specimens are multiple cable constructions. Requirements for plenum cable are considered the most restrictive in the industry. Qualification of flame retarded materials by either E-84 or UL 910 is a major hurdle involving considerable time and expense. This test method is intended to provide only comparative measurements of surface flame spread and smoke density measurements with that of select grade red oak and fiber-cement board surfaces under the specific fire exposure conditions described herein. This test method exposes a nominal 24-ft (7.32-m) long by 20-in. (508-mm) wide specimen to a controlled air flow and flaming fire exposure adjusted to spread the flame along the entire length of the select grade red oak specimen in 5 ½min. Measurement of heat transmission through the tested surface. The effect of aggravated flame spread behavior of an assembly resulting from the proximity of combustible walls and ceilings. Classifying or defining a material as noncombustible, by means of a flame spread index by itself. 1.7 This standard is used to measure and describe the response of materials, products, or assemblies to heat and flame under controlled conditions, but does not by itself incorporate all factors required for fire-hazard or fire-risk assessment of the materials, products, or assemblies under actual fire conditions..